This new camera and sensor combination, WEAPON 8K VV, offers Full Frame lens coverage, captures 8K full format motion at up to 60 fps, produces ultra-detailed 35.4 megapixel stills, and delivers incredibly fast data speeds of up to 300 MB/s. WEAPON® with HELIUM™ 8K S35 delivers stunning resolution and image quality—creating clean and organic images that bring your footage to life. RED has taken the next step in exceeding the flexibility and beauty offered by film. At 35 Megapixels, 8K offers 17x more resolution than HD—and over 4x more than 4K. With the 6K RED DRAGON® sensor, you can capture over 9x more pixels than HD. Unrivaled detail and impressive native exposure eclipse 35mm film in both latitude and image density. With the new Carbon Fiber body the camera is beautifully lightweight and perfect for handheld or gimbal set ups. EPIC ushers in the next generation of digital cinema, featuring a 5K sensor capable of capturing 1 to 120 frames per second at full resolution. From fashion spreads to 3D IMAX features, EPIC has crossbred elite photography with unrivaled cinema capability—all in a camera the size of a DSLR. In challenging lighting conditions, EPIC makes it easy to adapt with its ability to reach up to 18 stops of dynamic range with HDRx. Remarkable technology packed into a 5lb body - with EPIC, less is more. Based on a large-format 4k version of the Alexa sensor, the Alexa LF meets and exceeds creative and technical production requirements. It’s gorgeous new sensor allows the use of new or old medium format lenses on their LPL mount or PL to get that crisp and shallow depth of field. See it in action in the recent film: The Shape of Water. Compact, lightweight and self-contained, the ARRI ALEXA Mini is a versatile additional tool in the ALEXA camera range. Crews will find that the ALEXA Mini perfectly complements their ALEXA shooting kit, eliminating the complications of working with third-party cameras for specialized shots and keeping everything within a single system that is trusted all over the world. ARRI proudly introduces AMIRA – (most economical), a versatile documentary-style camera that combines exceptional image quality and affordable CFast 2.0 workflows with an ergonomic design optimized for single-operator use and extended shoulder-mounted operation. Ready to pick up and shoot straight out of the camera bag, AMIRA is hardy enough to take anywhere and features in-camera grading with preloaded 3D LUTs, as well as 100 fps slow motion. It is suitable for a great variety of production types, from reportage and corporate films to TV drama and low-budget movies, so wherever you are headed and whatever you need to shoot, let AMIRA be your companion. The first camera on the scene remains at the center of the family; it is the keystone of a modular and upgradeable system with exceptional image performance that is simple to operate, reliable in even the most extreme environments and versatile enough to cover a wide range of workflow and budget requirements. Whether your production is destined for the cinema or television, ALEXA will empower you to tell your story in exactly the way you think it should be told, with pictures of breathtaking richness and detail. 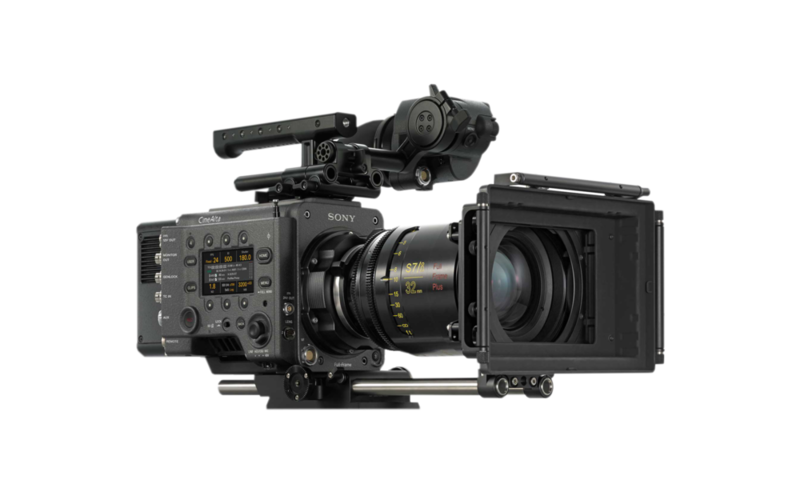 The Sony VENICE CineAlta 6K Digital Cinema Camera offers an interchangeable PL or E-Mount, built-in ND filters in 8-stages, 15+ stops dynamic range, a wide color gamut with deep darks yet retained highlights, plus LED menus on camera left and right. Let us know what products you're interested in and if you require any guidance and/or suggestions. (818) 235-6078 or email us at rentals@deckofaces.com to speak with a customer service representative.